A young specimen of Dryopteris wattsii in the Cairns Botanical Gardens. As it can easily be guessed, the Wet Tropics of Australia is a prime spot for ferns in Australia. Although much can be said in praise of the luxuriousness of ferns in the temperate rainforests of Melbourne and Tasmania, a huge proportion (~65% or over 250 species) of the fern species in Australia is found in the Wet Tropics. Additionally, about 40 species are endemic to the region, and the species of this post, Dryopteris wattsii is one such species. The attractive pinnate frond with dark shiny green uppersides. Perhaps even more notable is the fact that Dryopteris wattsii was once called Revwattsia fragilis, and was considered the only member of the genus, i.e. it is a monotypic fern. In other words, not only was the species endemic, there are no other member of the genus anywhere else in the world. Still earlier 1915, the fern was named by Reverend W.W. Watts as a member of Polystichum, a well known genus of “shield ferns” in Australia and elsewhere. Like some Australian species of Polystichum, this fern has attractive long fronds (1-2m long), with a great potential to be used as an ornamental. However, various morphological features make the inclusion of this fern in Polystichum unacceptable. Some of these are the long-creeping rhizomes, kidney-shaped indusia (the spore bearing pouches), and the epiphytic habit are not characteristic of Polystichum. In the 1980s the eminent pteridologist (a specialist in ferns) SB Andrews in the landmark work Ferns of Queensland suggested that the species be recognised as a separate genus, and later botanist David Jones, in recognition of Reverend Watts, endowed the fern with a new genus name, Revwattsia. Any close relationship with Polystichum was dealt the nail in the coffin when Meghan McKeown and colleges applied phylogenetic analyses on the species to understand where the species fits within the Dryopteridaceae fern family. Using a number of chloroplast DNA markers , McKeown and colleges were able to investigate the relationships of Revwattsia fragilis within Dryopteridaceae. 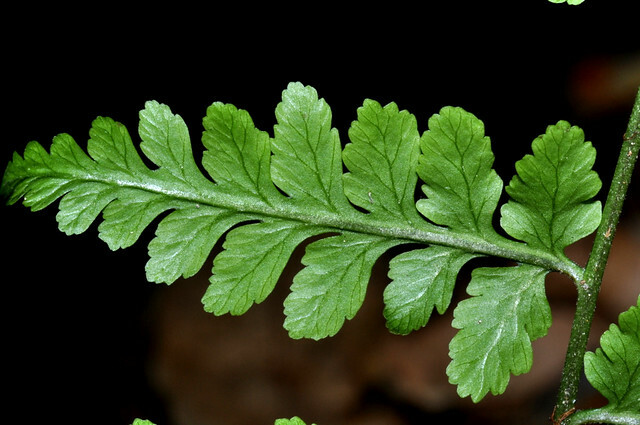 Their results confirmed that Revwattsia is distinct from Polystichum, but at the same time they also delivered a severe blow to the name Revwattsia, as they found that the species is much more related to southeast Asian species of ferns from the genus Drypoteris. To this end, McKeown and colleges therefore proposed that the species be renamed Dryopteris wattsii. They probably considered calling the species “Drypoteris fragilis“, but the species epithet “fragilis” was already taken up by another species elsewhere. Thus we have it. 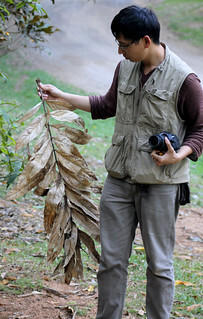 The shifting tides of taxonomy and phylogenetics have conferred an insignificant addition to the burgeoning 250 odd species of Dryopteris worldwide, but annihilated a monotypic genus from the Wet Tropics. Perhaps it is for the better that any allusion to fragility (“i.e.”fragilis“) was removed, and that a hint of reverence for Reverend Watts is maintained after the dissolution of “Revwattsia“. Frond underside of the frond. More pictures to come when I get lucky enough to see the species in sporulation. 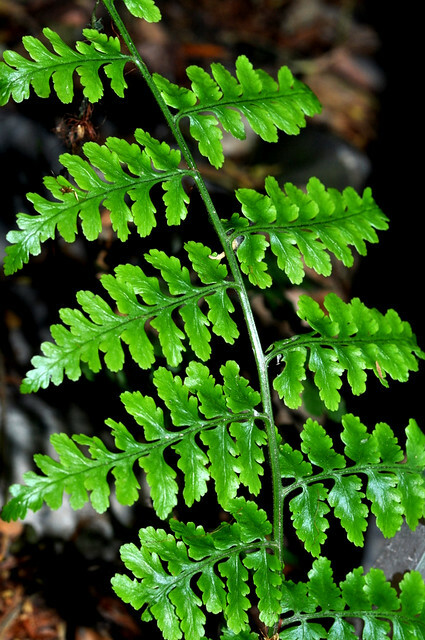 Monotypic or not, Dryopteris wattsii remains an important fern for conservation in the Wet Tropics. 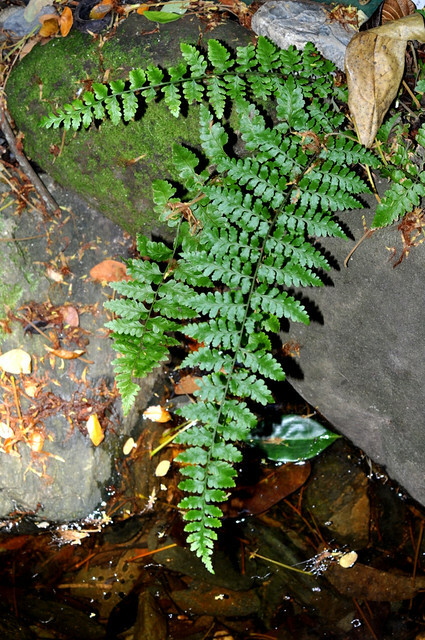 Dryopteris wattsii is a rare treasure and is known only from six small populations in wet rainforests in the Atherton Tablelands, with a combined total of less than a dozen plants. Andrews SB (1990) Ferns of Queensland. Queensland Department of Primary Industries. Brisbane. McKeown M, Sundue M, Barrington D (2012) Phylogenetic analyses place the Australian monotypic Revwattsia in Dryopteris (Dryopteridaceae). PhytoKeys 14, 43. Jones DL (1998) Flora of Australia, Ferns, Gynosperms and Allied Groups.Vol. 48, Melbourne: ABRS/CSIRO Australia. Watts WW (1915) [‘1914’] Some notes on the ferns of north Queensland. Proceedings of the Linnean Society of New South Wales Series 2, 39: 775, t. lxxxviii, fig. 9A–G. This entry was posted in Dryopteridaceae (Wood Fern family), Endemics, Habitat - Rain forest, Lifeform - Epiphytes, Lifeform - Ferns and tagged Dryopteridaceae, Dryopteris wattsii, Revwattsia fragilis. Bookmark the permalink.